Monday morning. I called on a prospect that visited our website who was looking for a hydraulic oil flushing service. Eventually I got in touch with Larry, the plant engineer at a metal manufacturer on the east coast. Their company processes specialty metals for equipment manufacturers, mostly in the aerospace and defense sectors. Larry told me that they had just finished building a new plant that was going to be used for a metal grinding operation. All of the hydraulic lines needed to be flushed in order to clear out the construction debris before the metal grinding machine could be safely started. If they didn’t remove the debris before starting it could cause failures with the pumps or servo valves in the hydraulic cylinders. Given their particular situation, I thought it would be best to visit the company’s plant in person prior to quoting the service work. We needed to measure fittings and determine the best way to bypass/jump the valve blocks and hydraulic cylinders. Within just a few days of my first conversation with Larry I traveled to their plant and performed a thorough on-site inspection. Within a week after our preliminary assessment I organized the equipment needed to perform the entire service job. I made a second visit with a colleague to confirm our measurements of all the system components that needed to be flushed. 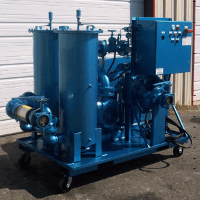 We also brought with us a 75-GPM portable oil flushing skid and all the appropriate fittings and hoses to flush out the metal grinder’s hydraulic system. This turned out to be a more complex job than we anticipated. Believe it or not, we ended up working 11 days straight while overcoming numerous technical challenges. Alas, by the time we were finally done, all the valve blocks and hydraulic cylinders were bypassed/jumped. We also made sure to flush all the individual line sections and the entire hydraulic circuit. We helped Larry and his team to achieve a minimum ISO cleanliness code of 16/14/11 or better on each hydraulic line and the overall system. We verified our results by using a portable laser particle counter (PDF), which we kept by our side during the operation. We worked long and hard, and in the end Larry and his team were very happy with the results of the oil flushing service that our crew provided. 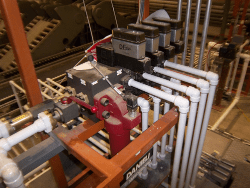 Do you have a question about hydraulic oil flushing or portable filter systems? Feel free to contact us anytime. Our friendly team of experts will be happy to help you out with your particular issue.